Have a summer wedding and thinking on what to wear, then invest in a good floral outfit for atleast one of your functions. Floral’s are not only trendy but are also perfect for a summer wedding, adding a very fresh and vintage look to the outfit. 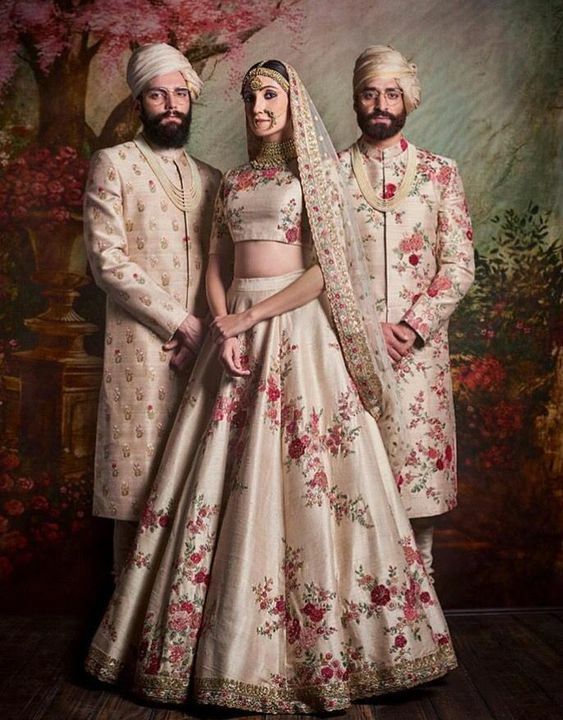 Here are few ideas how you can follow this trend in style…..
All over pattern– You can choose an all over floral lehnga in the same color and print, which has floral placement in an abstract design. A contrast dupatta can be taken over it. If it’s a print then get it highlighted with a nice hand embroidery, or you can simply club a floral print lehnga choli with a heavy hand embroidered dupatta. Go All white– Modern brides are showing a lot of interest in this color, which earlier was considered a taboo to be worn at the wedding. 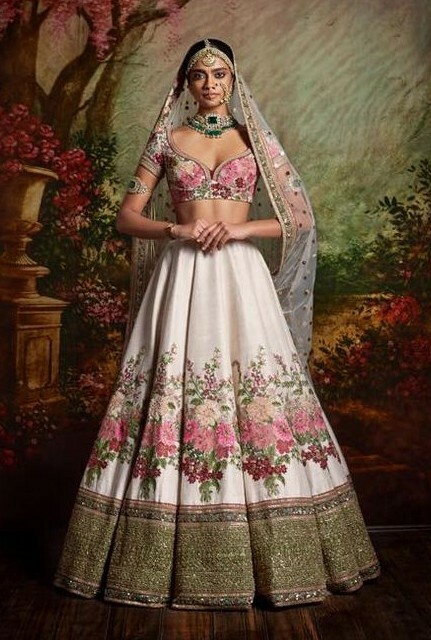 An all white lehnga with a heavy embroidered choli in contrast and subtle floral motifs looks appealing. A lehnga with a heavy gold border and embroidered in floral pattern halfway through, is an interesting pattern then the usual all overs. A heavy dupatta in white and gold completes the look. 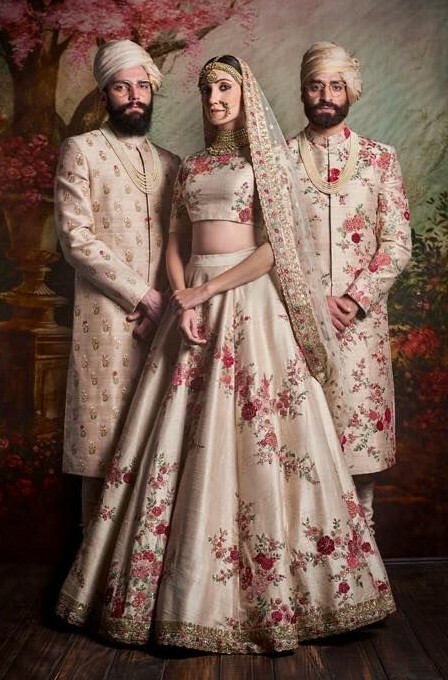 Matching Floral ensembles for couples– You can also try matching the embroideries and pattern for the bride and groom’s outfit. Floral patterns look equally good on men too if done in a subtle way. Floral Prints– Nice floral prints in cotton, jute, raw silk make a great base for creating lehngas. Just add pretty borders at the bottom for a heavy look. You can take it in a lehnga choli form with a dupatta, or wear it like a crop top with a floral skirt minus the dupatta. 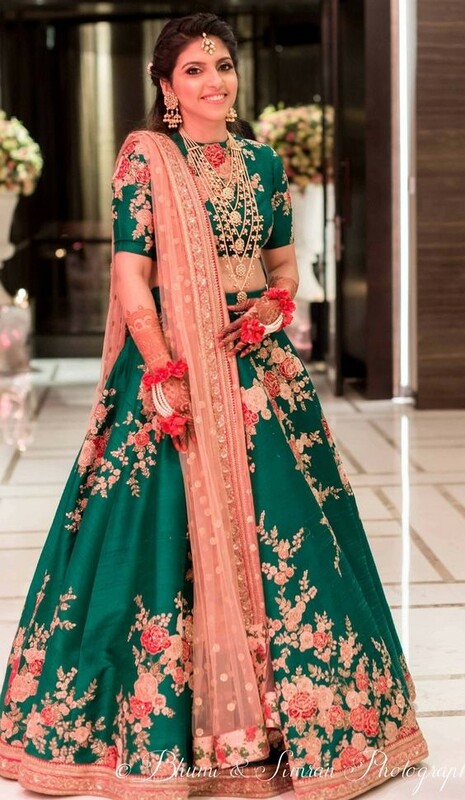 Floral dupatta– And if you want just a hint of floral pattern in your attire, choose a floral print dupatta with a simple lehnga, it will add a bit of this trend without making it loud.